A Contractual Waiver of the Right to Challenge Venue is Enforceable - В сложной финансовой ситуации приходит на помощь кредит наличными в Казахстане. Many contracts contain a forum selection provision or a venue provision. Contracts may even contain language that parties agree not to challenge or otherwise waive the venue of any filed lawsuit. This Agreement is to be construed and governed by the laws of the State of Florida (without giving effect to principles of conflicts of laws). Each party hereto irrevocably agrees that any legal action or proceeding arising out of or in connection with this Agreement may be brought in any state or federal court located in Florida (or in any court in which appeal from such courts may be taken), and each party agrees not to assert, by way of motion, as a defense, or otherwise, in any such action, suit or proceeding, any claim that it is not subject personally to the jurisdiction of such court, that the action, suit or proceeding is brought in an inconvenient forum, that the venue of the action, suit or proceeding is improper or that this Agreement or the subject matter hereof may not be enforced in or by such court, and hereby agrees not to challenge such jurisdiction or venue by reason of any offsets or counterclaims in any such action, suit or proceeding. Of relevance, this venue provision allowed the parties to bring suit in any state or federal court in Florida and stated that the parties agree not to assert that the venue of any suit is improper. A dispute arose between the members of the operating agreement. One of the members filed suit against the other member in Martin County, Florida. The other member moved to transfer venue to Palm Beach County, Florida arguing that nothing tied the dispute to Martin County. The trial court agreed and transferred venue to Palm Beach County. The appellate court, however, reversed. Why? Because the parties agreed that a lawsuit could be filed in any Florida court and, importantly, that they each waive the right to challenge venue. 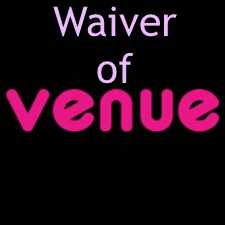 The parties’ agreement to waive any challenge to venue was enforceable. See Powers, Jr. v. Melick, 42 Fla. L. Weekly D288b (Fla. 4th DCA 2017). Consider venue provisions when entering into and negotiating contracts – any type of contract.